The TI-85 ViewScreen panel is connected with a flat-ribbon cable permanently to a modified TI-85 graphing calculator. Placing the panel on a raised platform with an additional lens on the overhead projector enlarges the image of the handheld screen so that each student can follow along. The used platform was in the 90s commercially available from the Polaroid Corporation to project Polaroid color-graph type 691 overhead transparencies. 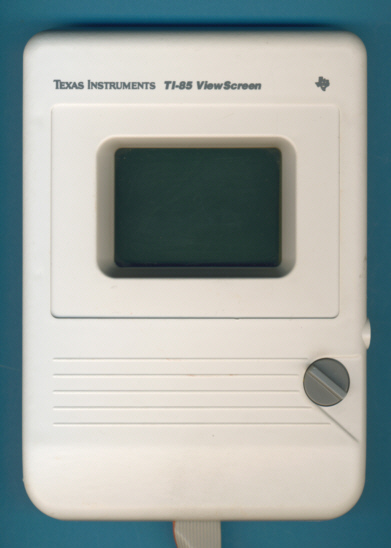 Don't miss the similiar TI-81 ViewScreen connected to the first generation TI-81 VSC. Main differences are the resolution of the LCD display and the added connector for an external AC adapter. © Joerg Woerner, February 23, 2009. No reprints without written permission.